Scuttlebug Forest (or World Star -1) is the first level of World Star in Super Mario Run. It can only be played after the player completes Bowser's Bob-ombing Run as Princess Peach. The level begins with a single Goombrat, followed by two Scuttlebugs. The first Pink Coin is immediately after, swinging on a string, and it is followed by a Super Mushroom, also on a string. The player must then jump off of a series of Goombrats, and then a Scuttlebug upon reaching the second Pink Coin. Some Hard Blocks follow, along with coins dangling from mushroom platforms and a Scuttlebug that must be jumped on to reach the third Pink Coin. The player must then bounce on a trampoline and follow the top path to the fourth Pink Coin. Afterwards, the player must bounce off of another Scuttlebug, then move across a series of Lifts on tracks and jump off two Scuttlebugs to reach the fifth and final Pink Coin. After two more Scuttlebugs, the Goal Pole is reached. The level begins with two Goombrats, followed by two Scuttlebugs. The first Purple Coin is immediately after a short slope, swinging on a string, and it is followed by a Super Mushroom, also on a string. The player must then jump off of a series of Goombrats, and then two Scuttlebugs upon reaching the second Purple Coin. Some Hard Blocks follow, along with coins dangling from mushroom platforms, two ! Switches that must both be pressed, and a Scuttlebug that must be jumped on to reach the third Purple Coin. After bouncing on a trampoline, the player will slide down a short slope. They must touch the Pause Block, then jump off of a Scuttlebug and follow a mushroom platform to the fourth Purple Coin. 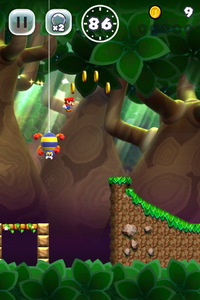 After following the remainder of the top path, the player must jump on a platform with a Goombrat and follow the top path again, moving across a series of Lifts on tracks and jumping off of two Scuttlebugs to reach the fifth and final Purple Coin. After four more Scuttlebugs, the Goal Pole is reached. The level begins with two Goombrats, followed by two Scuttlebugs. The first Black Coin is immediately after a short slope, swinging on a string suspended over a Lift on a track, and it is followed by a Super Mushroom, also on a string. The player must then jump off of a series of Goombrats, then wall jump to jump on another Goombrat to collect the second Black Coin. Some Hard Blocks follow, along with coins dangling along with Scuttlebugs, two ! Switches that must both be pressed, and trampolines that must be jumped on to reach the third Black Coin. A series of Lifts on tracks with Goombrats follows, with the fourth Black Coin at the end. The player must then jump off of a Scuttlebug to grab a ledge, then jump off of two Scuttlebugs and grab the ledge of a Hard Block to obtain the fifth and final Black Coin. After six more Scuttlebugs, the Goal Pole is reached. This page was last edited on January 2, 2019, at 19:05.